The first BBJ is based on the 737-700 with a stronger wing and landing gear from the 737-800. Auxiliary belly fuel tanks extend range, over 6,000 nmi (11,000 km) with nine tanks (500 lb (230 kg) empty each), but most operators install five auxiliary fuel tanks to fly up to 5,400 nmi (10,000 km). 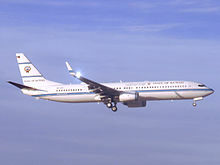 In 2002, the -800-based BBJ2 offered a 25% larger cabin with a similar range with five tanks, with the 2009 BBJ3 based on the 737-900. Aviation Partners winglets gave the BBJ 5% more range. A standard, retractable forward airstair allows for autonomous operations at remote airports. Early interiors were way over the 13,000 lb (5.9 t) allowance and the BOWs reached 104,000–8,000 lb (47,200–3,600 kg) over spec, but newer interiors can be 25% lighter for 99,000–100,000 lb (45–45 t) empty weights. Fuel burn is 4,830 lb (2.19 t) per hour at Mach 0.785, rising to over 5,700 lb (2.6 t) at Mach 0.82, twice as much as a faster Global 6000. Direct operating costs are $14,000 per hour, minor inspections come every 36 months and major inspections at 12-year for a 4-8 weeks down time. At FL 410, cabin altitude can be lowered from 8,000 ft to 6,500 ft, but it reduces airframe life to 26,000 down from 50,000 cycles, much higher than purpose-built business jets. Most operators fly their aircraft 200-250 h per year with 6-8 passengers, 500-800 h for corporations to less than 150-200 h for individuals. The CFM56 service program costs $240-260 per engine per hour, less than the Rolls-Royce BR700, with the engines staying on wing for at least 12,000-13,000 h for most, and up to 25,000-30,000 h. Fokker Services were developing 1.5 m (4 ft 11 in) wide windows for the BBJ in 2016. Twenty years after the 1999 introduction, 150 BBJs had entered service, triple the initial forecast of 50. The 2008 recession put ultra large jets under scrutiny and were divested by some companies Some BBJs are operated by governments for VIP transport. After the launch of the BBJ, Airbus followed suit with the launch of the Airbus ACJ derived from its A319 airliner, then the larger A320 and the smaller A318 Elite. Other smaller competitors include the Embraer Lineage, the Bombardier Global Express, the Gulfstream G550 and the Gulfstream G650. A BBJ costs US$9.57-10.13 per nautical mile to operate, whereas the faster G650ER costs $5.87 to 6.33. BBJ, or less frequently BBJ1, is based on the 737-700, and formed the basis for the 737-700ER. This was the initial variant. In United States Navy service, this is known as the C-40B Clipper. BBJ3 is based on the 737-900ER. BBJ C is a variant of the BBJ featuring the "quick change" capabilities of the 737-700C. This allows the aircraft to be used for executive duty during one flight, and to be quickly reconfigured for cargo duty for the next flight. BBJ MAX 8 and BBJ MAX 9 are variants of the Boeing 737 MAX 8 and 9 with new CFM LEAP-1B engines and advanced winglets providing 13% better fuel burn; the BBJ MAX 8 will have a 6,325 nmi (11,710 km) range and the BBJ MAX 9 a 6,255 nmi (11,580 km) range. The BBJ MAX 7 was unveiled in October 2016 and will have a 7,000 nmi (12,960 km) range, with 10% lower operating costs than the original BBJ while having a longer cabin and more under-floor baggage space. The MAX BBJ 8 first flew on April 16, 2018, and will reach 6,640 nmi (12,300 km) with an auxiliary fuel tank. It was first delivered by mid-October. 747-8: with a range of 8,875 nmi (16,436 km) with 100 passengers, eleven were ordered through December 2018, all delivered, and six were in service. The VIP 747 is delivered by BBJ in a "green" condition, meaning there are no interior furnishings so that the owner can design it to personal preference. B777: -200LR and -300ER with a range of 10,030 and 9,300 nmi (18,580 and 17,220 km) with 75 passengers, thirteen were ordered through December 2018, all delivered, and nine were in service. The BBJ 777X succeeded the BBJ 777 in December 2018. B777X: -8 and -9 with a range of 11,654 and 11,000 nmi (21,583 and 20,372 km) with 75 passengers. On December 10, 2018, Boeing launched BBJ variants of the 777X at the Middle East Business Aviation Association Show. The BBJ 777-8 offers a 3,256 sq. ft. (302.5 sq m) cabin, while the BBJ 777-9 provides a 3,689 sq. ft. (342.7 sq m) variant. B787: the −8 and the −9 have a range of 9,945 and 9,485 nmi (18,418 and 17,566 km) with 25 passengers, fifteen were ordered through September 2018 with twelve delivered and four in service. As with the 747, the VIP 787 is delivered by BBJ in a "green" condition. BBJs were initially operated by Fortune 100 companies like Aramco and Tracinda; NetJets, casinos like the Las Vegas Sands, but the 2008 recession put ultra large jets under scrutiny and were divested by many companies including The Limited, General Electric and Occidental Petroleum; or Chinese companies to avoid wealth displays. BBJ are now operated by private firms and individuals: Fresno's Assemi Group, Miami's Crescent Heights, Wichita's Town & Country Food Market, Funair Corp., toymaker Ty Inc., Fortress Transportation & Instructure, Jeffrey Katzenberg, Steven Spielberg, Washington Corp., Tutor Saliba or pachinko king Hideyuki Busujima, with many registrations hiding their owners’ identities. Most BBJs are operated by governments for VIP transport in U.S., Australia and Africa, plus Colombia, Turkey and India, UAE, Jordan, Malaysia, South Africa or Tunisia; or Middle East oil barons like Abu Dhabi, Dubai and Saudi Arabia royalty. Presidency (1) BBJ2 for Government VVIP flight. Mexican Air Force (1) 787 for government VIP flight, currently stored. 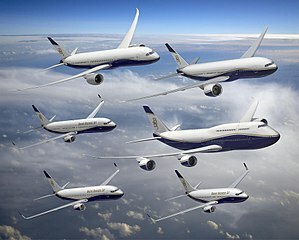 ^ "Boeing: Boeing Business Jets". boeing.com. Retrieved 23 February 2019. ^ Lynch, Kerry (16 May 2015). "Boeing Business Jets confident as it studies Combi". Aviation International News. ^ a b c d e Fred George (Jan 7, 2019). "Boeing Business Jet: Why Go Big? Because You Can". Business & Commercial Aviation. ^ David Donald (May 20, 2015). "First SkyView for BBJ". AIN online. ^ "Fokker proposes giant window to Boeing Business Jets". Flightglobal. 13 Apr 2015. ^ "Mission Costs for Ultra-Long-Range Jets Table". Aviation Week. May 2015. ^ "Boeing Business Jets to Offer the BBJ MAX" (Press release). Boeing. October 29, 2012. Retrieved October 30, 2012. ^ "Boeing Business Jets Unveils BBJ MAX 7" (Press release). Boeing. October 31, 2016. Retrieved November 1, 2016. ^ "Milestone paves the way for delivery of the newest version of the best-selling business jetliner" (Press release). Boeing. April 16, 2018. ^ "Boeing Business Jets Delivers First BBJ MAX Airplane" (Press release). Boeing. Oct 15, 2018. ^ a b c d e f g "Boeing Business Jets". Boeing. December 2018. ^ "Boeing Launches Longest-Range Business Jet Ever with BBJ 777X" (Press release). Boeing. Dec 10, 2018. ^ tjs (14 April 2014). "RI 'Air Force One' will not be armed". The Jakarta Post. Retrieved 17 January 2015. ^ "Dutch to replace Royal transport with 737 BBJ". flightglobal.com. 11 April 2017. Retrieved 12 April 2018. ^ "Polish gov't orders three VIP-configured B737NextGens". ch-aviation.com. Retrieved 12 April 2018.